The author selected Electronic Frontier Foundation Inc to receive a donation as part of the Write for DOnations program. 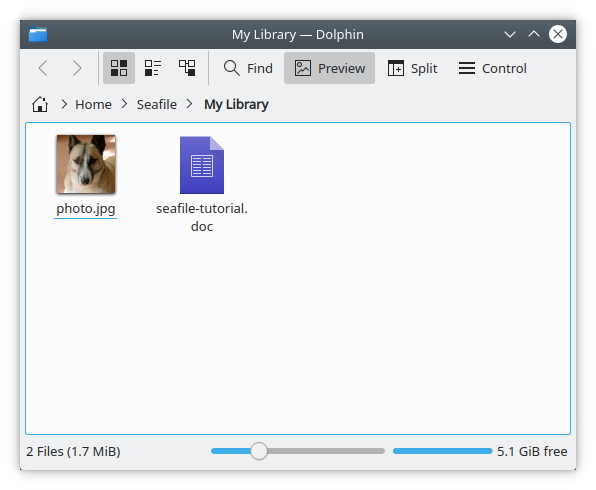 Seafile is an open-source, self-hosted, file synchronization and sharing platform. Users can store and optionally encrypt data on their own servers with storage space as the only limitation. With Seafile you can share files and folders using cross-platform syncing and password-protected links to files with expiration dates. A file-versioning feature means that users can restore deleted and modified files or folders. In this tutorial, you will install and configure Seafile on a Debian 9 server. You will use MariaDB (the default MySQL variant on Debian 9) to store data for the different components of Seafile, and Apache as the proxy server to handle the web traffic. 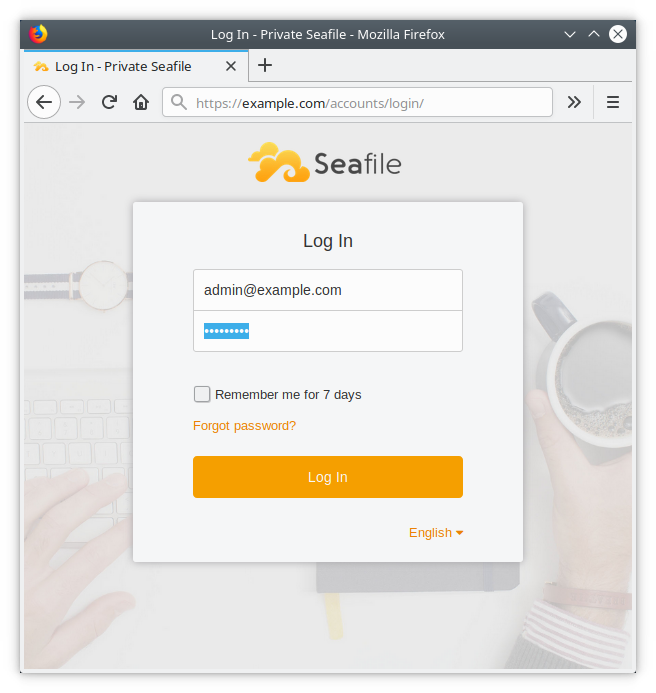 After completing this tutorial, you will be able use the web interface to access Seafile from desktop or mobile clients, allowing you to sync and share your files with other users or groups on the server or with the public. One Debian 9 server with a minimum of 2GB of RAM set up by following this Initial Server Setup with Debian 9 tutorial, including a sudo non-root user and a firewall. An Apache web server with a virtual host configured for the registered domain by following How To Install the Apache Web Server on Debian 9. An SSL certificate installed on your server by following this How To Secure Apache with Let’s Encrypt on Debian 9 tutorial. A fully registered domain name. This tutorial will use example.com throughout. A MariaDB database server installed and configured. Follow the steps in the How To Install MariaDB on Debian 9 tutorial. Skip Step 3 of this tutorial — “(Optional) Adjusting User Authentication and Privileges”. You will only be making local connections to the database server, so changing the authentication method for the root user is not necessary. Seahub: Seafile’s web frontend, written in Python using the Django web framework. 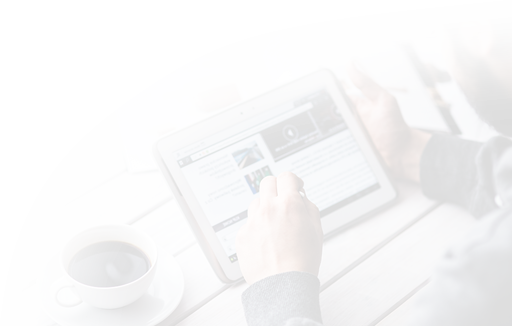 From Seahub you can access, manage, and share your files using a web browser. Seafile server: The data service daemon that manages the raw file upload, download, and synchronization. You do not interact with the server directly, but use one of the client programs or the Seahub web interface. Ccnet server: The RPC service daemon to enable internal communication between the different components of Seafile. For example, when you use Seahub, it is able to access data from the Seafile server using the Ccnet RPC service. Each of these components stores its data separately in its own database. In this step you will create the three MariaDB databases and a user before proceeding to set up the server. ccnet-db for the Ccnet server. seahub-db for the Seahub web frontend. seafile-db for the Seafile file server. Now that you have created a user and the databases required to store the data for each of the Seafile components, you will install dependencies to download the Seafile server package. Some parts of Seafile are written in Python and therefore require additional Python modules and programs to work. In this step, you will install these required dependencies before downloading and extracting the Seafile server package. The python-setuptools and python-pip dependencies oversee installing and managing Python packages. The python-urllib3 and python-requests packages make requests to websites. Finally, the python-mysqldb is a library for using MariaDB from Python and ffmpeg handles multimedia files. Now that you have installed the necessary dependencies, you can download the Seafile server package. At this stage, you have downloaded and extracted the Seafile server package and have also installed the necessary dependencies. You are now ready to configure the Seafile server. Seafile needs some information about your setup before you start the services for the first time. This includes details like the domain name, the database configuration, and the path where it will store data. To initiate the series of question prompts to provide this information, you can run the script setup_seafile_mysql.sh, which is included in the archive you extracted in the previous step. The script will now prompt you with a series of questions. Wherever defaults are mentioned, pressing the ENTER key will use that value. This tutorial uses Seafile as the server name, but you can change it if necessary. What is the name of the server? Enter the domain name for this Seafile instance. What is the ip or domain of the server?. For Question 3 press ENTER to accept the default value. If you have set up external storage, for example, using NFS or block storage, you will need to specify the path to that location here instead. Where do you want to put your seafile data? For Question 4 press ENTER to accept the default value. Which port do you want to use for the seafile fileserver? The next prompt allows you to confirm the database configuration. You can create new databases or use existing databases for setup. For this tutorial you have created the necessary databases in Step 1, so select option 2 here. Questions 6–9 relate to the MariaDB database server. You will only need to provide the username and password of the mysql user that you created in Step 1. Press ENTER to accept the default values for host and port. What is the host of mysql server? What is the port of mysql server? Which mysql user to use for seafile? What is the password for mysql user "seafile"? After providing the password, the script will request the names of the Seafile databases. Use ccnet-db, seafile-db, and seahub-db for this tutorial. The script will then verify if there is a successful connection to the databases before proceeding to display a summary of the initial configuration. Successly create configuration dir /home/sammy/seafile/ccnet. Your seafile server configuration has been finished successfully. As you will be running Seafile behind Apache, opening ports 8082 and 8000 in the firewall is not necessary, so you can ignore this part of the output. You have completed the initial configuration of the server. In the next step, you will configure the Apache web server before starting the Seafile services. In this step, you will configure the Apache web server to forward all requests to Seafile. Using Apache in this manner allows you to use a URL without a port number, enable HTTPS connections to Seafile, and make use of the caching functionality that Apache provides for better performance. Note: The Apache rewrite and ssl modules are also required for this setup. You have already enabled these modules as part of configuring Let's Encrypt in the second Apache tutorial listed in the prerequisites section. Next, update the virtual host configuration of example.com to forward requests to the Seafile file server and to the Seahub web interface. The Alias directive maps the URL path example.com/media to a local path in the file system that Seafile uses. The following Location directive enables access to content in this directory. The ProxyPass and ProxyPassReverse directives make Apache act as a reverse proxy for this host, forwarding requests to / and /seafhttp to the Seafile web interface and file server running on local host ports 8000 and 8082 respectively. The RewriteRule directive passes all requests to /seafhttp unchanged and stops processing further rules ([QSA,L]). You have now configured Apache to act as a reverse proxy for the Seafile file server and Seahub. Next, you will update the URLs in Seafile's configuration before starting the services. As you are now using Apache to proxy all requests to Seafile, you will need to update the URLs in Seafile's configuration files in the conf directory using a text editor before you start the Seafile service. Save and exit the file once you have added the content. What is the email for the admin account? What is the password for the admin account? Open https://example.com in a web browser and log in using your Seafile admin email address and password. Once logged in successfully, you can access the admin interface or create new users. Now that you have verified the web interface is working correctly, you can enable these services to start automatically at system boot in the next step. To enable the file server and the web interface to start automatically at boot, you can create the respective systemd service files and activate them. Here, the ExectStart and ExecStop lines indicate the commands that run to start and stop the Seafile service. The service will run with sammy as the User and Group. The After line specifies that the Seafile service will start after the networking and MariaDB service has started. You can learn more about systemd unit files in the Understanding Systemd Units and Unit Files tutorial. When the server is rebooted, Seafile will start automatically. At this point, you have completed setting up the server, and can now test each of the services. In this step, you will test the file synchronization and sharing functionality of the server you have set up and ensure they are working correctly. To do this, you will need to install the Seafile client program on a separate computer and/or a mobile device. Visit the download page on the Seafile website and follow the instructions to install the latest version of the program on your computer. Seafile clients are available for the various distributions of Linux (Ubuntu, Debian, Fedora, Centos/RHEL, Arch Linux), MacOS, and Windows. Mobile clients are available for Android and iPhone/iPad devices from the respective app stores. Once you have installed the Seafile client, you can test the file synchronization and sharing functionality. Open the Seafile client program on your computer or device. Accept the default location for the Seafile folder and click Next. In the next window, enter the server address, username, and password, then click Login. At the home page, right click on My Library and click Sync this library. Accept the default value for the location on your computer or device. Add a file, for example a document or a photo, into the My Library folder. After some time, the file will upload to the server. The following screenshot shows the file photo.jpg copied to the My Library folder. Now, log in to the web interface at https://example.com and verify that your file is present on the server. Click on Share next to the file to generate a download link for this file that you can share. 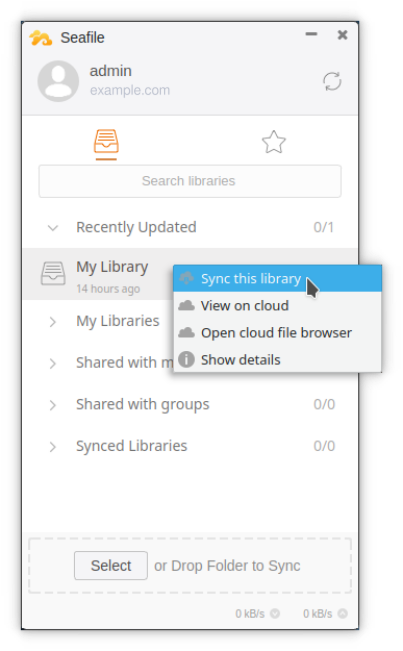 You have verified that the file synchronization is working correctly and that you can use Seafile to sync and share files and folders from multiple devices. In this tutorial you set up a private instance of a Seafile server. 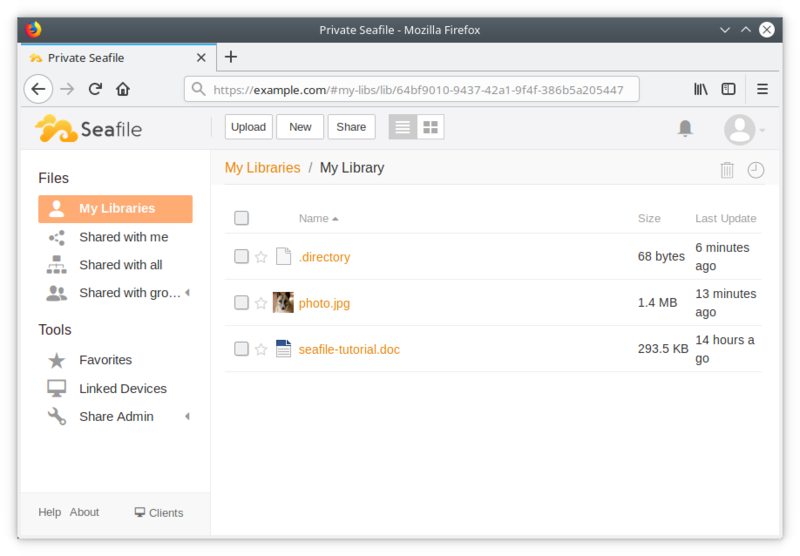 Now you can start using the server to synchronize files, add users and groups, and share files between them or with the public without relying on an external service. When a new release of the server is available, please consult the upgrade section of the manual for steps to perform an upgrade.